Recently, the U.S. Food & Drug Administration released an environmental assessment that provides an overview of factors that potentially contributed to the contamination of romaine lettuce with E. coli that was implicated in a 2018 multi-state foodborne illness outbreak. The assessment can be found here and includes the background on the outbreak; the environmental team approach; and factors potentially contributing to the introduction and spread of E. coli; along with recommendations for the prevention E. coli in leafy greens. Local in-depth knowledge and actions are critical in helping resolve potential routes of contamination of leafy greens in the Yuma growing region, including Imperial County and Yuma County, moving forward. FDA urges other government and non-government entities, produce growers and trade associations in Yuma and Imperial Counties to further explore possible source(s) and route(s) of contamination associated with the outbreak pathogen and with other foodborne pathogens of public health significance. This information is critical to developing and implementing short- and long-term remediation measures to reduce the potential for another outbreak associated with leafy greens or other fresh produce commodities. The findings in the Environmental Assessment appear to provide little new information but will be closely reviewed by Western Growers and others as part of our industry’s ongoing efforts to ensure food safety. Immediately after the outbreak, Western Growers collaborated with the leafy greens industry to help lead a task force that would assess the source of the outbreak, as well as develop recommendations to prevent future outbreaks. While sources of contamination remain uncertain, the task force made concrete recommendations to industry for assuring water is safe and adequate, assessing and mitigating risk from adjacent land uses as well as others to address risks from equipment and climatic conditions. These recommendations go well beyond the requirements of the FDA’s own Produce Safety Rule and have already been incorporated into the California and Arizona LGMA requirements. State auditors are now charged with verifying adherence to these new controls through announced and un-announced audits that occur throughout the seasons. The industry is furthering its efforts to learn more including through research guided by respected entities such as the Center for Produce Safety and working directly with California and Arizona academic teams. There is a strong and broad commitment to continually work to improve our food safety system. The U.S. Food and Drug Administration (FDA) today announced that it has joined with the U.S. Department of Agriculture’s National Institute of Food and Agriculture (NIFA) in a collaborative partnership to administer and manage the National Food Safety Training, Education, Extension, Outreach, and Technical Assistance Program. Recognizing the importance of and need for food safety training for small farm owners and food processors, the FDA and USDA’s National Institute of Food and Agriculture (NIFA) are announcing a grant program that will provide funding so that these critical groups receive training, education and technical assistance consistent with standards being established under the FDA Food Safety Modernization Act (FSMA). This is one of several education and outreach efforts associated with the implementation of FSMA. Priority will be given to those submitting grant applications to train owners and operators of small and medium-size farms; farmers just starting out in business; socially disadvantaged farmers; small food processors; small fruit and vegetable wholesalers; and farms that lack access to food safety training and other educational opportunities. A Federal, State, or local agency, State cooperative extension services, non-profit community based or non-governmental organizations, institutions of higher education, tribes and tribal stakeholders or a collaboration of two of more eligible entities are among the entities eligible for funding. Education and technical assistance projects are an essential element in the FSMA implementation strategy. Such efforts will help ensure widespread voluntary compliance by encouraging greater understanding and adoption of established food safety standards, guidance, and protocols. They also facilitate the integration of these standards and guidance with a variety of agricultural production systems, encompassing conventional, sustainable, organic, and conservation and environmental practices. Meeting the technical assistance needs for produce safety will require an investment well beyond what is being announcing today. This grant program underscores the commitment of both agencies to working with the grower community, Cooperative Extension Services (a nationwide education network), our state and tribal government partners, and institutions of higher education to more fully define the need and strategies for meeting it. FDA is first issuing a request for applications for the establishment of a National Coordination Center (NCC) for Food Safety Training, Education, Extension, Outreach, and Technical Assistance Program. Once funding is available, separate requests for applications for the establishment of Regional Centers will be forthcoming. For more information on FDA’s Food Safety Modernization Act, visit http://www.fda.gov/fsma. On December 19, 2014, the Centers for Disease Control and Prevention (CDC) announced that it is collaborating with several states and the U.S. Food and Drug Administration (FDA) in an investigation of the outbreak of Listeria monocytogenes infection (listeriosis) in commercially produced, prepackaged caramel apples. The first wrongful death lawsuit was filed in California by James Raymond Frey on behalf of his late wife, Shirlee Jean Frey, 81, against Safeway Inc. over the commercially produced, prepackaged caramel apples, implicated in a 10-state Listeria outbreak responsible for a total of 29 people (as of yesterday) who have been hospitalized, including five deaths. Though the product in question was linked to Carnival brand and Kitchen Cravings brand caramel apples, specifically, CDC is warning the public not to eat caramel apples–plain or with nuts or other toppings, but clarified, “at this time, no illnesses related to this outbreak have been linked to apples that are not caramel-coated and not prepackaged or to caramel candy.” Safeway removed the product from it shelves. The investigation is still working to determine specific brands or types of commercially produced, prepackaged caramel apples that may be linked to the illnesses. Listeria is one of the more deadly food pathogens. The most recent Listeria outbreak occurred three years ago from Colorado-grown contaminated cantaloupes, causing three dozen deaths. The pathogen affects primarily women, newborns, older adults and other people with compromised immune systems. Symptoms include fever, muscle aches and gastrointestinal problems. The California Apple Commission is working with other apple producing states and the U.S. Apple Association on this issue. Should California apple growers receive any calls regarding this issue or need additional information, please contact Alexander Ott, Executive Director the Commission office in Fresno by email at calapple@calapple.org or phone 1-559-225-3000. Chances are when you’re scooping that vanilla bean ice cream into your bowl for dessert, you’re focused on the flavor about to hit your taste buds, not on whether it may give you a foodborne illness. That confidence in the safety of California’s dairy products — the state’s top agricultural commodity, valued at nearly $7 billion in annual retail sales — results in part from the efforts of the San Bernardino branch of the California Animal Health and Food Safety laboratory system. This network of laboratories, headquartered at UC Davis and administered by the UC Davis School of Veterinary Medicine on behalf of the California Department of Food and Agriculture, performs surveillance and diagnostic testing for livestock and poultry. The San Bernardino laboratory carries out such work on milk and dairy products that are submitted by the state’s Milk and Dairy Foods Safety Branch. The lab’s on-site bacteriology section tests for a variety of disease-causing microbes including Listeria, Brucella, Salmonella, Campylobacter and E. coli O157:H7 — all of which can cause severe illness and even death. The U.S. Centers for Disease Control and Prevention estimates that each year roughly one in six Americans (or 48 million people) get sick with a foodborne disease. Of these, 128,000 are hospitalized and 3,000 die from these illnesses. However, such diseases have almost been eliminated from licensed milk and dairy products, thanks, in large part, to a strong regulatory framework, including adherence to pasteurization and laboratory standards. Approximately 1,500 samples of milk, dairy products and water arrive monthly at the San Bernardino lab resulting in approximately 4,200 tests conducted by a team of eight technicians. These microbiological assessments monitor bacteria populations and the effectiveness of pasteurization in destroying harmful bacteria. “The laboratory system has been a successful partnership between the state and UC Davis since 1987,” said its director, Richard Breitmeyer. He noted that it was natural in the 1990s to expand the lab’s statewide regulatory testing services to include milk products. Before then testing was limited to samples from only Southern California. In 2000, the California Department of Food and Agriculture was so impressed with the accuracy and timeliness of the California Animal Health and Food Safety laboratory system that it placed all such statewide regulatory compliance testing in the network of labs, in a move that enabled the state to cut costs, speed analysis and consolidate testing. Three years ago, the state asked the laboratory system to also begin testing milk and dairy products for chemical components such as fat and protein content. The San Bernardino lab now provides this service. The San Bernardino laboratory is considered the state reference lab for California and holds the distinction of being the only veterinary facility in the nation set up as a regulatory testing facility. In addition to running tests for the state, the laboratory also is certified by the U.S. Food and Drug administration, under the National Conference of Interstate Shippers program guidelines to run microbiological tests. As part of this testing program, the state sends samples from three sources: the farm, processing plants and retail establishments where the finished product is sold. The lab also tests some exports such as ice cream for microbiological components and dry goods such as powdered milk. State milk and dairy officials may submit samples from a location if a report comes in that someone has become ill after eating or drinking at a particular business. State and federal investigators also routinely check farmers markets and small establishments for raw or illegally processed milk and dairy products that could pose a serious health risk. Those products are sent to the San Bernardino lab to be tested for the presence of bacteria or improper pasteurization. Samples sent to the lab must be transported at the proper temperature, arrive within 60 hours of collection and be properly packaged before they are tested for general bacteria populations. If the testing criteria aren’t met, those samples are rejected for testing and reported to the state for recollection. Any test results indicating the products were not produced in compliance with state regulations are reported to the California Department of Food and Agriculture, which is authorized to enforce the regulations. After milk samples have been analyzed for bacteria and other indicators of improper sanitation at a facility, they move on to be tested for drug residue and other unwanted substances such as antibiotics, which may have been used to treat sick cows. Farmers are required to keep milk out of the supply line until the medication has cleared from the cow’s system and the milk meets strict requirements established by the FDA. Other testing, such as checking for proper pasteurization and possible water contamination, complements the tools used by state officials to ensure the quality and safety of the milk supply. CAHFS is a public service program of the university. The primary objectives of the CAHFS are to provide appropriate and timely diagnostic support to safeguard the health of California’s dairy, livestock and poultry industries and to protect the public health from animal disease. The California Department of Pesticide Regulation (DPR) announced that once again, the majority of produce it tested annually had little or no detectable pesticide residues and posed no health risk to the public. 95 percent of all California-grown produce, sampled by DPR in 2013, was in compliance with the allowable limits. DPR tested 3,483 samples of different fruits and vegetables sold in farmers markets, wholesale and retail outlets, and distribution centers statewide. More than 155 different fruits and vegetables were sampled to reflect the dietary needs of California’s diverse population. 43.53 percent of the samples had no pesticide residues detected. 51.51 percent of the samples had residues that were within the legal tolerance levels. 3.99 percent of the samples had illegal residues of pesticides not approved for use on the commodities tested. 0.98 percent of the samples had illegal pesticide residues in excess of established tolerances. A produce item with an illegal residue level does not necessarily indicate a health hazard. Each piece of fruit or vegetable may legally contain trace amounts of one or more pesticides. The amount and type of pesticide (known as a tolerance), is limited by the U.S. Environmental Protection Agency. DPR’s Residue Monitoring Program staff carries out random inspections to verify that these limits are not exceeded. Most of the 2013 illegal pesticide residues were found in produce imported from other countries and contained very low levels (a fraction of a part per million). The majority of the time they did not pose a health risk. One exception occurred in 2013 when DPR discovered Cactus pads, imported from Mexico, that were tainted with an organophosphate-based pesticide. This had the potential to sicken people. DPR worked with the CA. Dept. of Public Health to issue an alert to consumers in February 2014. DPR also worked diligently to remove the entire product it from store shelves and distribution centers. In addition, DPR asked the US Food and Drug Administration to inspect produce at the borders and points of entry to stop shipments into California. The nation’s food safety grades are out and the results are mixed. 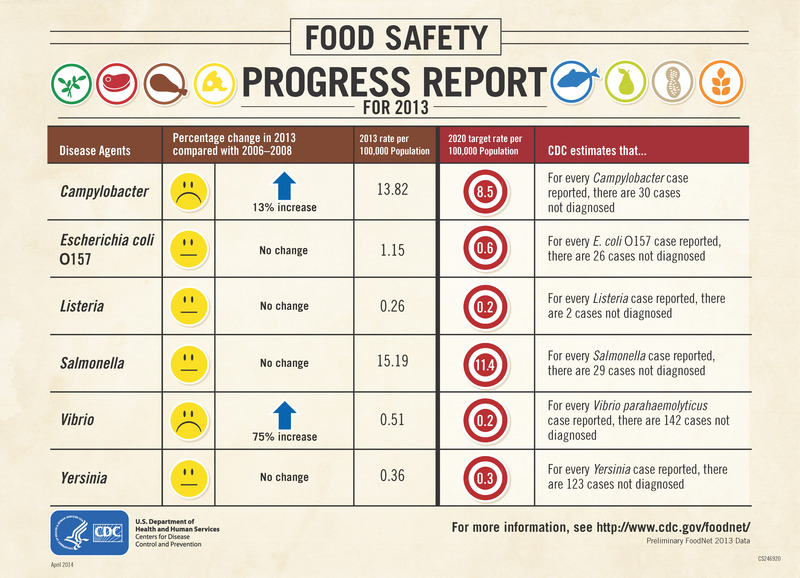 U.S. Department of Health and Human Services Centers for Disease Control’s (CDC) annual report card shows that foodborne infections continue to be an important public health problem in the United States. The rate of salmonella infections decreased by about nine percent in 2013 compared with the previous three years, bringing it to the rate last observed in the 2006-2008 baseline period. But campylobacter infections, often linked to dairy products and chicken, have risen 13 percent since 2006-2008. Vibrio infections, often linked to eating raw shellfish, were at the highest level observed since active tracking began in 1996; however, rates of infections caused by Vibrio vulnificus, the most severe species, have remained steady. Rates of the other foodborne infections tracked have not changed since the period between 2006 and2008. The data for the report card come from the Foodborne Diseases Active Surveillance Network (FoodNet), a group experts, from CDC, ten state health departments, the U.S. Department of Agriculture’s Food Safety and Inspection Service (FSIS), and the U.S. Food and Drug Administration (FDA). FoodNet surveillance covers 48 million people, encompassing about 15 percent of the American population. FoodNet sites are located in Connecticut, Georgia, Maryland, Minnesota, New Mexico, Oregon, and Tennessee, and selected counties in California, Colorado, and New York. In 2013, FoodNet logged just over 19,000 infections, 4,200 hospitalizations, and 80 deaths from the nine germs it tracks. Young children were the most affected group for seven of the nine germs that FoodNet tracks. New standards for cut-up poultry parts and plans to modernize poultry inspection are already in the works to increase the safety of chicken. Regulations designed to help prevent food safety problems have been proposed for many sectors of the food industry, including produce farms, food facilities, food importers, food transporters, and third-party auditors/certification bodies. In addition to new regulations, everyone can help prevent food poisoning. The food industry can require safer ingredients and can implement preventative controls while restaurants and consumers should follow safe practices in the kitchen. These include cooking meat to proper temperatures, washing produce, preparing meat and fresh produce on different surfaces. Consumers should know there are risks to consuming unpasteurized milk, soft cheeses made with unpasteurized milk, and raw oysters, especially for certain populations at risk for foodborne illness. 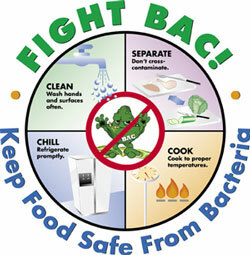 For more information on avoiding illnesses from food, and knowing who is at greatest risk, please visit www.foodsafety.gov. FoodNet collects information to track rates and determine trends in laboratory-confirmed illnesses caused by nine pathogens transmitted commonly by food: campylobacter, cryptosporidium, cyclospora, listeria, salmonella, Shiga toxin-producing O157 and non-O157 E. coli, shigella, vibrio, and yersinia. Annual data are compared with data from the previous three years (2010-2012) and with data from 2006-2008 to measure progress. Since 2010, FoodNet has been tracking the increasing use of culture‐independent diagnostic tests instead of culture by clinical laboratories for diagnosis of some bacterial enteric infection. Replacement of culture challenges the ability to identify cases, monitor trends, detect outbreaks, and characterize pathogens. CDC works 24/7 saving lives and protecting people from health threats to have a more secure nation whether these threats are chronic or acute, manmade or natural, human error or deliberate attack, global or domestic. Today the U.S. Food and Drug Administration announced it will hold a webinar on April 4 to discuss the scope of the Environmental Impact Statement (EIS) for the agency’s Food Safety Modernization Act (FSMA) proposed rule to establish standards for growing, harvesting, packing and holding of produce for human consumption. The FDA is holding this meeting to seek public input on the issues and alternatives that it should consider when preparing the EIS and to inform the public of the provisions of the proposed rule that may significantly affect the quality of the human environment and anticipated alternatives FDA plans to consider. Scope of proposed rule and implications to land use and land management. The meeting will be from 1:00-5:00 p.m. at the Harvey W. Wiley Federal Building in College Park, Maryland. The meeting will also be Webcast at 2 p.m. For more details on how to participate in person or online, visit the FDA website. PMA members and industry are also encouraged to visit the FSMA Resource Center for additional information on the FSMA and its numerous proposed rules. The U.S. Food and Drug Administration reported TODAY that Dole Fresh Vegetables, a subsidiary of Dole Food Company based in Monterey, California, voluntarily recalled a limited number of cases of bagged salad yesterday. The products being recalled are Dole Italian Blend, Fresh Selections Italian Style Blend, Little Salad Bar Italian Salad and Marketside Italian Style Salad, with Use-by date of March 12, 2014 due to a possible health risk from Listeria monocytogenes. Dole Fresh Vegetables is coordinating closely with regulatory officials and has posted the recall on their website. No illnesses have been reported in association with the recall. This precautionary recall notification was issued based on one sample of Dole Italian salad that yielded a positive result for Listeria monocytogenes in a random sample test conducted by the Canadian Food Inspection Agency. The salads were distributed in 15 U.S. states (Connecticut, Florida, Illinois, Indiana, Kentucky, Maryland, Massachusetts, Michigan, New Jersey, New York, North Carolina, Ohio, Pennsylvania, South Carolina, Virginia) and 3 Canadian provinces (New Brunswick, Ontario & Quebec). William Goldfield, Director of Corporate Communications at Dole Fresh, said, “On the trace back, we’ve been able to identify where the lots came from, the plant they were processed in, and that allows us to trace forward to the distribution points for these salad products.” Dole Fresh Vegetables customer service representatives are already contacting retailers and are in the process of confirming that the recalled product is being removed from the stream of commerce. Although the products are one day past the Use-By date, it is highly unlikely that any product is still available at retail; however, retailers should check their inventories and store shelves to confirm that none of the product is mistakenly present or available for purchase by consumers or in warehouse inventories. Listeria monocytogenes is an organism that can cause foodborne illness in a person who eats a food item contaminated with it. Symptoms of infection may include fever, muscle aches, and gastrointestinal symptoms such as nausea or diarrhea. The illness primarily impacts pregnant women and adults with weakened immune systems. Most healthy adults and children rarely become seriously ill.
No other salads are included in the recall. Only the specific Product Codes, UPC codes and March 12, 2014 Use-by date identified above are included in the recall. Consumers who have any remaining product with these Product Codes should not consume it, but rather discard it. Retailers and consumers with questions may call the Dole Food Company Consumer Response Center at (800) 356-3111, which is open 8:00 am to 3:00 pm (PT) Monday – Friday. Founded in Hawaii in 1851, Dole Food Company, Inc., with 2010 revenues of $6.9 billion, is the world’s largest producer and marketer of high-quality fresh fruit and fresh vegetables. Dole markets a growing line of packaged and frozen foods, and is a produce industry leader in nutrition education and research. The Company does business in more than 90 countries and employs, on average, 36,000 full-time, regular employees and 23,000 full-time seasonal or temporary employees, worldwide.